As long as trade shows have been taking place, pop up displays have been a popular choice of exhibition stand for many originations all over the world. At PrintDesigns we have been supplying this demand with efficient and versatile pop up stands since 1999. With Cross Braced models being unrivalled for their rigid frame, and magnetic stands easy to fold down and transport from trade show to trade show, it is easy to see why many favour traditional displays. For those considering their next pop up display purchase however, there is a new choice of product available which may suit the needs of certain organisations more than conventional designs. 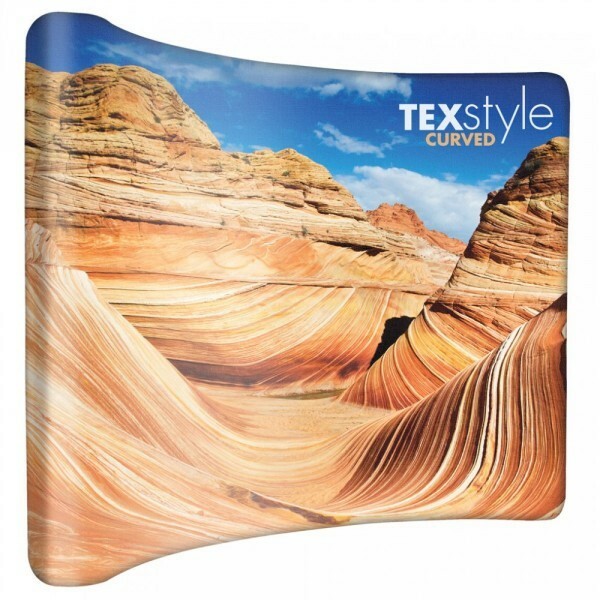 If you are searching for inspiration for your next exhibition stand, read on as we present to you the innovative range of TEXStyle pop up stands – they might just help your business boom at your next exhibition attendance! Great portability is no doubt an aspect of traditional pop up displays that is reason for its status as a classic exhibition stand stable. 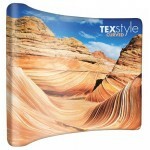 TEXTStyle pop up display stands however present movability like no other. Rather than using magnetic panels, which can often bend and break in transit, the graphics for this new era of display stand are simply printed onto one piece of tubular fabric. The stretchy material slides onto the frame like a sock, and can be easily removed and folded to a very small size after use, for incredible portability. Do you like to keep it simple? Trade shows can be very busy, with limited time to make an impact. With each member of staff having huge lists of important tasks to do and information remember, choosing an exhibition stand that is easy to use is a key step to helping the day run smoothly. The frame on a TEXTStyle pop up display is made up of sections of strong, lightweight aluminium tubing that is held together by bungee cord. Missing pieces of the frame will be something of the past! Fixed together by aligning the matching stickers and then finished off by sliding the tubular fabric over the frame, these display stands can be assembled with ease, every time. Of course, these new style of pop up display stands won’t appeal to every customer. We continue to stock a range of tried and tested magnetic frame and cross braces pop up stands for those who are confident in the solution. Any business looking to add something new to their marketing portfolio however can view the full range of TEXTStyle pop up displays and the bundle deals on offer on our website, to see if these could be the right solution for you!